So I’m outside at dawn each and every morning (farmers do not get snow days, rain days, weekends, holidays, or even sick days off) This winter has had some right cold mornings for this kid as those temperatures have plummeted to a wind chill of the high teens and 20s some days. Now I can bundle up pretty well, but whatever I did my ears were still cold. What is a girl to do? Well, first be thankful she is a fiber lover and has a stash. A few hours work and dilemma solved. I remembered one day that I had some alpaca from Starry Knight that I had spun and was just sitting, waiting for the perfect job. I had at last found that perfect place for it. So I gathered up the skeins and then went looking for a headband pattern. Now I crochet and do not knit. And after perusing patterns decided that just thick and basic was the way to go. But being me, of course, I changed it and ended up crocheting a longer first row than the simple pattern suggested. You see, I wanted to be sure that it would cover my ears and do the job at hand. Then it was just a double crochet in the back loop along each row. After going so long, I decided that maybe I had made it too wide after all so then needed to decrease for the area at the back of the neck, at least. Now I may say that I crochet, that doesn’t mean I am a spectacular wonderful crocheter. I do some nice things but all in all I crochet like many things in my life. I call my method “By the Seat of My Pants”. So I didn’t go looking for proper way to decrease and then increase again, but I did my own thing. It all worked in the end and can I say, I haven’t had a single cold ear since. Actually, I have even had a sweaty forehead some mornings before I got back inside. What better way to show it off than with my other morning friend – tea. So now with these cold mornings, I get a pot of tea going and under a cozy before heading out. When I get back inside I can take off my headband with my warm ears still intact and drink a warming cup of tea and then a second cup and then… Yep, tea is a great friend in this weather as well. A problem solved without having to go to a store, spend money, and solved in a way that has worked so well. Nothing commercial could be as good. Well, except maybe that hat Mark bought at Housestead Roman Fort on Hadrian’s Wall that day that was so incredibly miserable, rainy, cold, windy, miserable. If anyone knows where it ended up in our move, we’d appreciate you letting us know. That aside, I’m a happy camper. I did finally finish a scarf I started not too long ago. You see, my mother had a friend who gave her some spools of yarn. Yep, the kind fiber people like but what on earth was she going to do with them? So she held on till I visited her and gave them to me. Now I loved the colors in this one and thought I would just play with it on my Zoom Loom and so started making a square. Not the easiest as this yarn (Which has a fancy name for its style, but not being one to use these types I don’t remember what it is.) has little loops off the sides of it which just are begging to get in the way. But then to compound that, I decided to weave them together into a scarf. I had played with this idea before, and have posts on it, but have never made an official good enough to use project with the method. So besides the little loops getting in the way, I was also trying to catch the loops of one while weaving the next. I can just be a glutton for punishment. In the midst of creating, I needed a handmade gift for a friend, so decided that is what I needed to get me to finish it. So I got a few more squares added and then promptly forgot to take it to give away. YIKES! How me is that? So, back home I added a another square (couldn’t decide how long to make it) and then sent it in the mail. I will admit it is far from perfect as it was hard to keep tract of what was where. But in the end I loved the colors which are much more jewel-toned that show here on my computer. I did add a single crochet edging around it to help hold it all together so that it didn’t get pulled out of place somewhere. You can ask me how I know it can get pulled out of place? It has been awhile since I posted. I have been in the midst of a larger project for spinning than I normally do. As in, I came up with a plan for all of my handspun, early stuff, that was lying around. Now I have been spinning for a few years though not as continuously to be a consummate master of it. But I have been spinning and do enjoy it. One day this past spring I hit on a plan for a project. 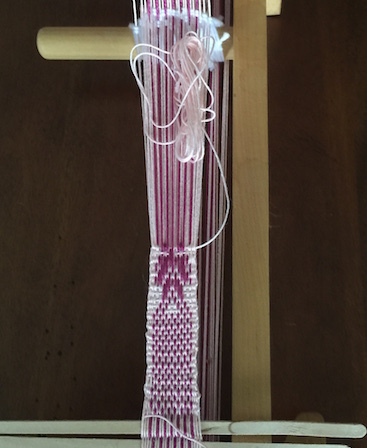 I had a Zoom Loom and loved using it. I had made some squares with my handspun with it, and I have posted before about that at Projects Abound and When Projects Aren’t Going Well. So you can see it has been a couple of years since I decided that using my handspun that was in small lots, not perfect, needing something to happen to them was perfect on a pin loom. Alas, what was to happen to these squares that I had been making over the past couple of years and mainly here recently? This spring I decided that a perfect project would be to make a cloak. So taking out my squares I laid them out several times on the floor to make patterns and decide what would work with all these diverse squares. Then my three week trip this summer was coming up. I would be driving Mark’s truck so space was not an issue. They all came with me as well as a spindle and more wool and the Zoom Loom and crochet hook to continue making squares and crocheting them together. I sat for a week watching the extended Lord of the Rings and Hobbit movies with my father and spun, wove, and crocheted away. Got quite a bit of the project done on that trip. As this project is about handspun, past and present, it is very eclectic in its colors, spinning, quality of spinning and wool, well really everything about it. As it is an evolving project on this end now (though still not completed) there are a few things I would do different but at this point I’m not taking anything apart. It is what it is. Now I’m spinning and working on a border around the whole thing. Had a pretty merino silk mix that is all the crocheting that you see in the above picture. The colors in it were real subtle and once spun even less so. It seems to be just a black. Though there is a glow about it that doesn’t say black like the picture says. I have run out of that so now have spun some generic black wool I have. Will be interesting to see how the two look together. Now all the spinning being done this summer is on spindles. When traveling I take my Bosworth. But at home I use my Golding. It never leaves home but oh, I love using the Golding most. This black wool has been interesting in seeing how color is really so indefinite. I know that’s not the right word, and I should some day look up proper terminology for what I observe. But it was amazing, to me, to watch this fiber as I drafted it looking toward a window and seeing a blue glow all about it. As the light came through the thin fiber strands it had a pretty blue tint. I know that all has to do with the dying and how black is created in dyes but still despite the chemistry etc. I love to see it happen. As we all need reminders. 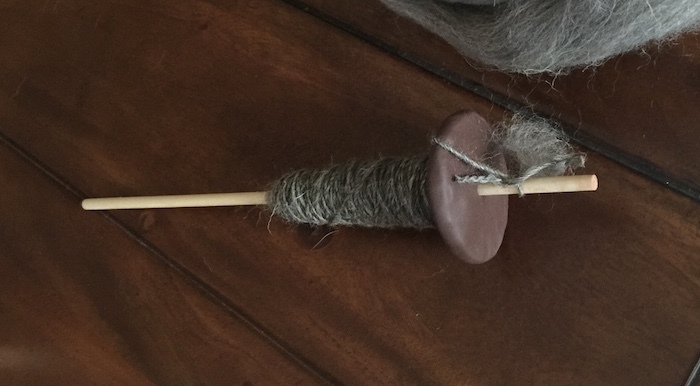 I went out to look at my very first spinning and the wrist distaff I made with it. Actually my very first was a red that I wove into a hat and it sold at the CHH sale. Rather surprised me that the two hats sold. But a very close second is this white. I didn’t find it. YIKES! I do need to figure out what happened to it. I wouldn’t have gotten rid of, given away, whatever it. It should be still about as a reminder. Thankfully, I did find a picture on the computer of it so here is my first and yes, despite that thin bit in the picture above, I have vastly improved. Well we are moved into our new home these past two weeks. Does that mean we actually have everything unpacked and a home found for each item? Absolutely not! I need Mark’s help for some things and he has different priorities, so I will still have to wait some on him. But in unpacking what is available at the moment, I thought I needed a record of three doilies I have. 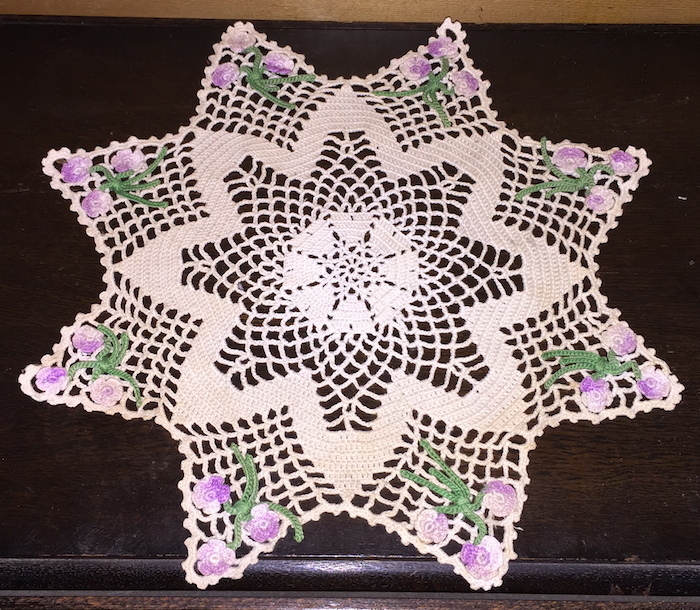 I don’t remember how I came into possession of the following doily. 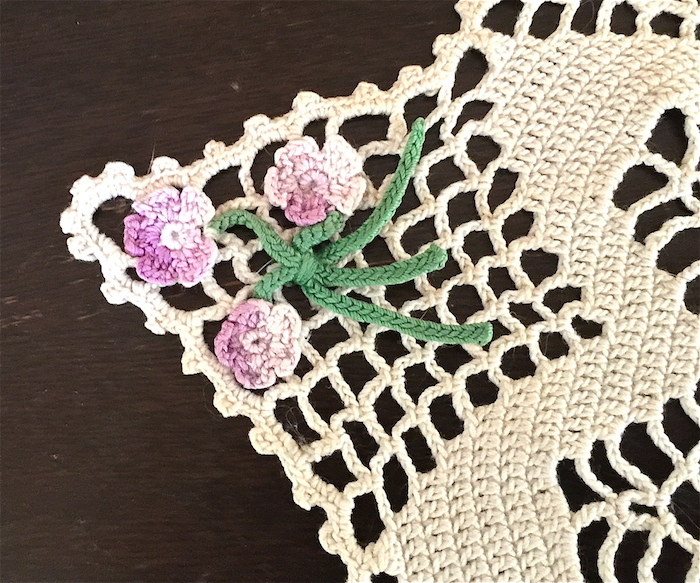 I know that it was crocheted by my maternal grandmother, Wilba Cowger. Now she had cancer for 12 years and as she died when I was 14, none of us grandkids really knew her outside of cancer. But I have been told all about this wonderful woman that we saw only glimpses of at times. I know she did knit, and we all got knitted socks one Christmas when she was feeling better. I was given her knitting needles after my grandfather’s death though I don’t know a whit about knitting and couldn’t tell you a knit from a purl. Ok, so I know a small whit about it. I know two terms. I do crochet though, but have never crocheted with such a small hook as this was done with. And look at those cute flowers added at the points. I will admit that I have not kept this well. Upon perusing it, I realize that it was probably quite white at one time though I never remember it white. I will say that for the pictures it did get a good ironing for the first time in probably forever. I couldn’t take a picture with the flowers closed up and the stems willy nilly. This has sat under an oil lamp for a few years, but I still haven’t decided where in this incarnation it will abide. 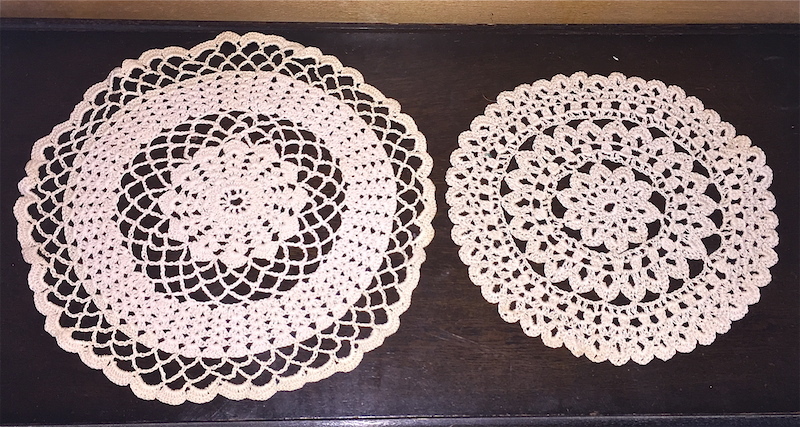 Now the next two doilies were crocheted by my paternal grandmother. Virginia Cummins. I do remember her crocheting, and I don’t think anyone on that side of the family knits at all – though I might be surprised. But my Grandma Cummins did crochet though her main pastime was quilts. All by hand and not a whit of a machine to be seen by any quilt. 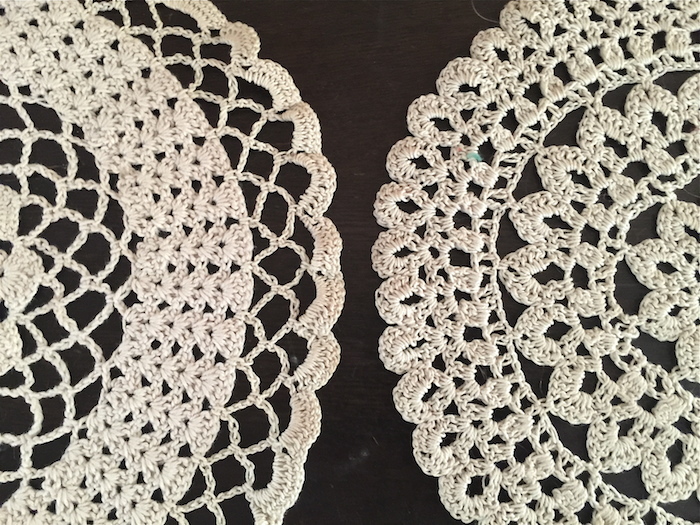 These two doilies have always sat in my hutch under two sets of dishes that I love. So alas and alack, you don’t really see much of them. But then most people wouldn’t know what was up anyway and I know what is back there so I enjoy. And who knows, their life may be why they are still in almost perfect order. Just like the day that Grandma gave them to me. I can say that these were not originally white so don’t feel bad about the color. The second picture, as far an my monitor is concerned, is closer to their real color. It is nice to have my grandmother’s close by even all these years later. Well right after the new year I went with a friend to Yarnorama in Paige to check out the new year sale. I found some yarn that I liked. It was called Silky Wool and was 45% wool, 35% silk, and 20% nylon. It was on the clearance shelf (always a plus when you find something you like) and was 20% off. So I bought four, each a different color that went together well. They were 50g each. Ok, enough of the dry stuff. I then had a time finding a project to use it. I did get a crochet magazine for half price the same day but I just wasn’t getting with the projects in it. I actually really bought it for the article on crochet hooks and the differences in them and why. That was a big help as I have always wondered why all the differences. I did learn one bit that I like for my hooks so now if I buy more I know what I will look for. Now this is the project I did mention in my last post. It did not start well at all. But in getting it going, I decided to do each group of rows in a different pattern. Now the yarn was in skeins, as it turned out. Oh the joys of making balls, not! But by the fourth one I had saved a toilet roll and rolled it up like a nostspindle and it actually went pretty well, and I was proud of it. You can see in the back the other colors and the shawl in process waiting for this lavender color to join it. 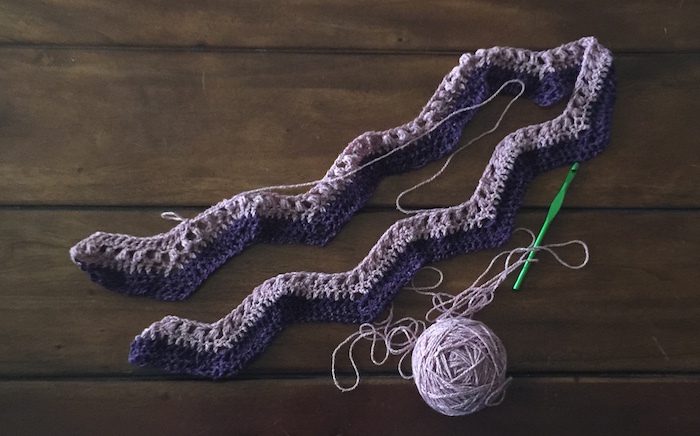 As I progressed with this “simple pattern” about half through it I figured out one of the things I wasn’t getting and also that you couldn’t just use the graph to do it as you were suppose to be going down in crochet hook size after each group. Well, I did start doing it the new way but still think if I had done it correctly, then it would have gotten too small quickly. I had made it wider than the pattern said as it just didn’t seem big enough and am glad I did do that. One thing I learned this morning is that light makes a big difference in how the colors look. This dimmer incandescent light is how I like the colors best the dark row has a deep burgundy look. I really absolutely love the look of it above and if you look close at it, you can see in the valleys where I figured out what I was suppose to be doing though I still don’t think I did it quite the way they wanted it done but it was closer than the lower rows. You were suppose to end up with decreases in each row and a nice little neck opening by the time you got to the top. Alas and alack. I was making this so not quite there. This is more what it looks like in sunlight. The colors all wash out and my burgundy becomes a dark purple. Now the front was to have buttons down it. Alas and alack again. I ran out of my favorite color (guess which one?) and so one placket was grey and one row of the whatever color it is. The other side is lavender on the outsides and grey inside. I did decide though that it needed a way to close to stay on so looking at the leftovers. I decided to crochet a long string with all four colors. There was just a couple scraps of the burgundy one so that determined the length of the two ties. It actually looks nice, I think, and works well. So we made it to the end of the project and this was all the yarn leftover. Also see what the poor shawl was suppose to look somewhat like. Guess I had just way too thin of yarn to really duplicate it as the picture. I am happy with how it did turn out, just need to remember not to let people know what it was supposed to be. So I am still sitting here in the condo on a 32 degree day hating to have to walk two dogs which means out the door, down the way, down the stairs, and out to the grassy yard at the end. If all is great then they get a long walk around, if not, then it is short and back mama runs in whether they want to or not. I know all three of us will be happy when they can be just turned loose in a yard with no leashes and can stay as long as they want. But that aside, sitting here I have some reading and fibery things to do. Alas the reading is going better than the fibery arts. Mostly. So the colors are great. But the pattern …. Hopefully by the end it will get itself worked out and look great. First I did start another inkle pattern. My eyes got big and I picked a detailed pattern from The Weaver’s Inkle Pattern Directory. There is this beautiful pattern on page 77 called Baltic-Style 13. So I started it and it just doesn’t look well and is a devil for me to figure out each row. So it sits. I never think it looks right, though I think as it grows the previous rows will look better though the immediate ones need more around them to look ok. I did see a mistake in it though it does look ok and could be right if you didn’t know what the pattern was suppose to be. Alas and Alack. I need to get back to it. Next I did go to Yarnorama during their end of the year sale and got some pretty yarn. So I found an easy crochet pattern and went to work. Now I really can do basic crochet. I have done lots within the whole scope of my life, but for a pattern that looks so easy I am making this very hard. I have frogged two rows and it is sitting once again at a trouble spot. No matter how careful I am I still don’t get the right number of stitches where they need to be. Can I scream? Funny when I picked this pattern it reminded me of watching my mom and aunt back in the 70s crocheting afghans that were this basic pattern. Now if they can do it, why can’t I? This is a bit fancier with every fourth row being a puffy stitch but all the same…. So also while at Yarnorama I succumbed to a weakness and bought a bag of Jacob wool. Alas did I have a spindle in this neck of the woods with me? Of course not. They are all in storage. Why I didn’t keep one out is beyond me, but alas I hadn’t spun for awhile at home so didn’t consider it suddenly being necessary. So I had to come up with something. I bought a dowel rod (actually a package of this length) and got some Filo clay and brought it home. Having never used the clay before, I didn’t know what I was in for but set about playing with it and boy does it take a bit to warm it up and get to mold. But I persevered and created a disk. Now was the tricky part as it just says to bake it and looking online was not much help beyond low heat and 15 minutes to an hour. How was one to know? Anyway, I made it, was happy with the results, and have a spindle. I remembered how to do a half hitch at the top so with no more ado, it actually works. Crazy but all I have to remember is to have a bit longer leader at the top than I would on my other spindles and keep the hitch near the top and it spins nicely, and I have yarn. Hopefully I will get quite a bit plyed and then will use it in my handspun weaving project when it and I are in the same place again. So this is where I sit at this time. I will now return to spinning and hopefully back to the other two and can report a completion of something before to many days past. I just saw this picture and was having flashbacks to my early days learning to spin. 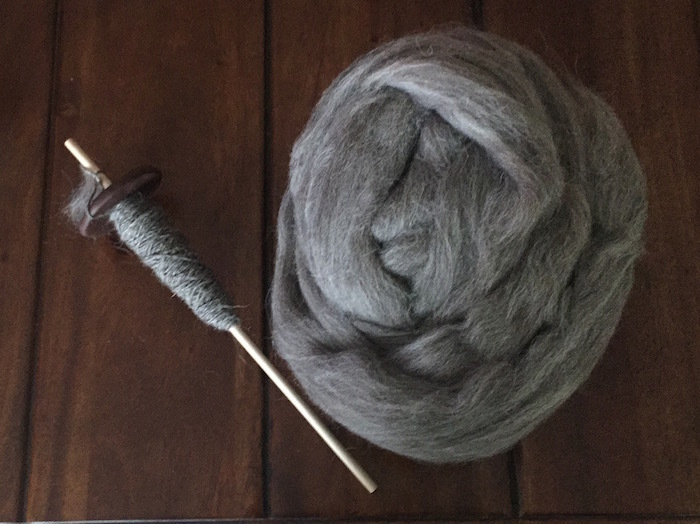 I had acquired some blue faced leicester wool and it was the first that I could spin easily and was proud of what was coming off my spindle. This was before I got my spinning wheel so it was all done on a Bosworth drop spindle. About this same time on one of the spinning Yahoo groups there was CAL started. I had never heard of such a thing nor participated in one which I guess if you had never heard of it before then odds on you never participated either. So anyway, several years ago I joined in and you would get some sheets of choices to make while crocheting your shawl every so many weeks. You then began at the neck which was nice as there was no long chains to start out. I never can get the count right on a chain. Involves too many numbers. I know, I know, not really; but it can be too many to keep count if you are as number challenged as I am. So as you crocheted away you never knew for sure what your shawl was going to look like as each time you got four choices and you would pick one and start crocheting. Then when you got a new set of four choices you got something different going on with your shawl. Now I will admit that my crocheting is pretty basic and there were some stitches in the patterns I chose that got simplified as I just couldn’t seem to make them work. But all in all I did enjoy crocheting the shawl and spinning the wool. Now I gave this shawl to my sister for the simple reason that she never got a shawl from me in our deep dark past. One Christmas we had agreed to make each other a gift. She embroidered a scene of Washington Crossing the Delaware for me. She did finish it eventually, and I got it as it was when finished. It still sits with some of my work of finished projects that never became anything. Alas for her, I never finished that shawl. I remember the bulky yellow acrylic yarn that it was too be and I can see it a bit in my mind’s eye. Alas it languished all the way to oblivion. So the Christmas after this was completed I gave it to her as her very belated shawl. She alas, never remembered our agreement so many Christmas’s past but was thankful for the shawl none the less. She now uses it in her fourth grade class when they learn about home production and what our forefathers had to do for themselves.